A determined nature and strong work ethic have helped Leigh Thompson go far in academia — and now, in athletics. In August, Thompson, the J. Jay Gerber Professor of Dispute Resolution & Organizations, was named the world champion in her age group (50 to 54) in the International Cycling World Championship Time Trial in St. Johann in Tirol, Austria. Thompson entered the world of competitive cycling only four years ago, when her husband, Bob Weeks ‘97, encouraged her to explore the sport. 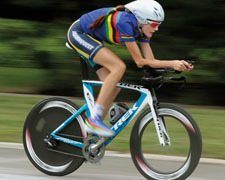 Thompson joined a training group through Vision Quest Coaching, where she engaged in rigorous workouts that transformed her from recreational cyclist to elite competitor.